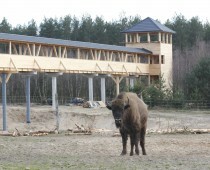 After last events a bison called Pyra had to imediately leave the previous place of stay. 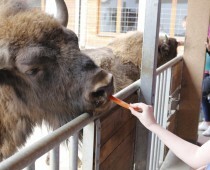 On 27.04.2015 according to the decision of Regional Directorate for Environmental Protection in Szczecin there were carried out immobilisation and transportation of the animal to another place – enclosure of Benek Association in Szewce near Poznań. In spite of difficult land conditions action was a success. Pyra, although in advanced age, went through immobilisation quite well. We hope that he would be satisfied in his new home and live long until the calm old age. Po ostatnich wydarzeniach żubr imieniem “Pyra” musiał niezwłocznie opuścić miejsce swojego dotychczasowego bytowania. 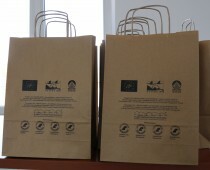 W dniu 27.04.2015 na podstawie decyzji wydanej przez RDOŚ Szczecin zostały przeprowadzone immobilizacja i transport zwierzęcia do innego miejsca- zagrody Stowarzyszenia Benek w Szewcach pod Poznaniem. 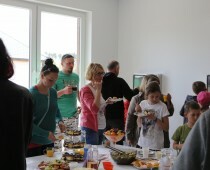 Akcja, mimo trudnego terenu, przebiegła sprawnie. Pyra, choć jest w podeszłym wieku, całkiem dobrze zniósł immobilizację. Mamy nadzieję, że w nowym domu zazna wszystkich wygód i doczeka spokojnej starości. 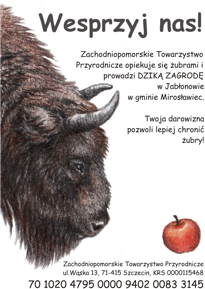 On last sunday – 25.04.2015 there was organised first workshop for local communities related to social acceptance for European bison and minimalisation of damages made by bisons within the framework of the project “Diversification and development of the population bison in north-western Poland”. 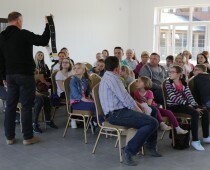 The workshop met with high interest, both for older and younger participants. 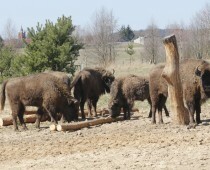 A workshop lecture concerned the history of development of population of western Pomeranian E.bison and activities of Western Pomeranian Nature Society. 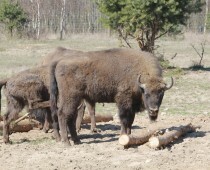 The auditory could get to know our bison-related activities within voivodhsip of Western Pomerania. 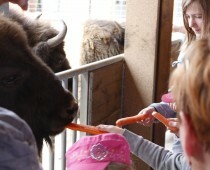 Moreover, there was a treat waiting for our guests and after lecture we all visited the enclosure. 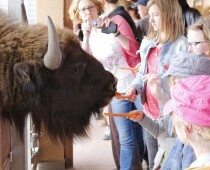 The attraction for the guests was a chance of feeding bisons directly from hand and seeing them from close yet safe distance. The newest telemetry data show that Lucky Chap is continuing his journey towards south-east. Currently he is staying between Bydgoszcz and Inowroclaw. The wolf has been moving so far mainly between forest areas to the north from Zlotow and Pila. Later, he rapidly turned towards south to Bydgoszcz Forest crossing Bydgoszcz canal twice. When observing transmitted signals, we hoped that he would go towards Bydgoszcz Forest because of presence of wolves on those areas. Suprisingly, he turned back near Nowa Wielka Wies. 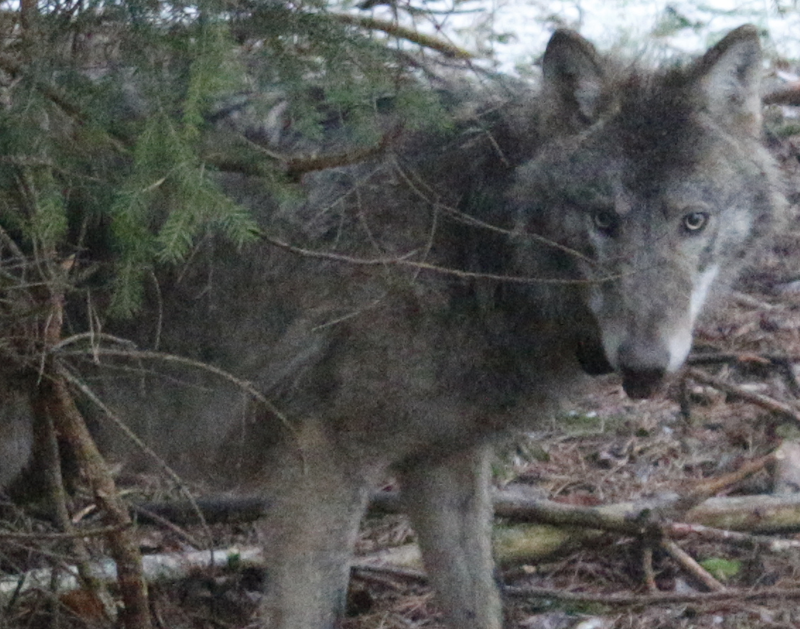 Data show that the wolf wandered near forest area near labiszyn crossing Notec river. It is hard to say why he did so. 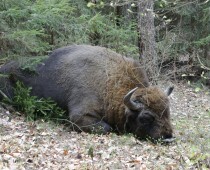 The areas he crossed near Bydgoszcz were rather unfavourable by exposing the animal too much to people. In Bydgoszcz Forest itself there had been encountered at least one pack of wolves – Lucky Chap could enter a territory of one of them and this might bring a retreat. We are waiting for next data.. The earth has greened again. The sun awakens flora and fauna to life with its touch. 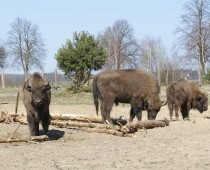 After long winter months bisons impaqtiently awaiting for first ray of the spring sun. For them this is basically a time for intense feeding up after the winter. Herds are going away from feeders and wandering around looking for fresh grasses. Last year’s calves are going through compensation of growth now. The abundance of high protein sources of food makes calves grow fast and get similar to mature individuals. Spring is also the time of losing winter undercoat. Sheding hair happens gradually. It starts near neck and spreads all over their body. Bulls in this time stays away herds intensely gaining weight by devouring vast amounts of grass. 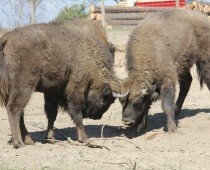 Younger bulls stay in small bachelor groups while older ones prefer to live singly. 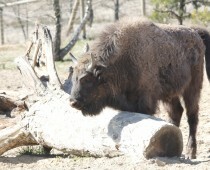 They would get back to the main herd aroud late summer when there starts mating season. April and may is the time of first deliveries, so we can start looking out for toddlers hiding between legs of their protective mothers.